An innovative scheme to leverage Central Valley farmland as temporary wetlands on the Pacific Flyway helped birds navigate California's five-year drought, according to a new analysis. More than four years ago, in the midst of California’s most punishing drought on record, conservation groups began working with growers and citizen scientists to identify and maintain habitat for wetland birds on agricultural land, as KQED reported. The Central Valley is in the middle of the Pacific Flyway, and millions of birds stop to rest at wetlands in the region during their migrations. 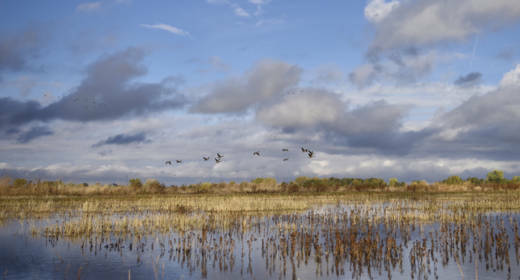 Since more than 90 percent of historically occurring natural wetlands in the Central Valley are gone, largely displaced by agriculture, the birds have to work with what's there. So, conservation groups devised a strategy to help them out: The Nature Conservancy and the Natural Resources Conservation Service started paying rice farmers to keep their fields flooded during the post-harvest months, allowing migratory birds to take refuge in these “pop-up wetlands.” For farmers and conservationists, participating in this type of incentive program was risky: farmers had to put in additional labor, the conservation groups offset the estimated costs, and neither group knew for sure whether the plan would actually work. But now enough time has elapsed to get some answers. Researchers used satellite data to understand how wetland bird habitat changed over the course of the drought and to estimate how much the incentive programs for farmers helped. From satellite images taken between 2000 and 2015, the researchers could detect how much open water was available for birds during non-drought, moderate drought, and severe drought years. They found that the severe drought dramatically reduced available wetland habitat, with declines of up to 80 percent in agricultural areas and up to 60 percent in managed wetlands. To assess the effect of incentives for flooded farms, the researchers honed in on rice fields, calculating what percent of the total flooded rice habitat could be attributed to two incentive programs during times of severe drought. The Nature Conservancy’s BirdReturns program was responsible for up to 61 percent of available flooded rice habitat in the fall and the Natural Resources Conservation Service’s Waterbird Habitat Enhancement Program (WHEP) provided up to 100 percent of available habitat in the winter. The results show that severe drought can have huge impacts on wetland habitat, and incentives programs can help. The two programs operated at different times of year: BirdReturns focuses on the fall and spring, and WHEP on the winter months. In the analysis, these complementary timelines functioned to maintain wetland habitat in rice fields for much of the year. The results show that severe drought can have huge impacts on wetland habitat, and incentives programs can help. However, the direct effects of drought on birds are not yet clear. Habitat is a pretty good proxy for population impacts, since habitat loss has been documented to be a leading cause of wetland bird declines, and of wildlife declines more generally. And research has shown that bird densities can be very high in flooded agricultural fields. But Reiter and his colleagues want to put some real numbers on the effects of severe drought on wetland birds. The incentive programs are set to continue for the time being -- but both are dependent on ongoing funding: the BirdReturns program relies on funding from the nonprofit Nature Conservancy, and the Natural Resources Conservation Service’s WHEP is counting on a renewal of funds in the federal Farm Bill. Ideally, Reiter says, the incentive programs would be “a short-term thing, that instills a new kind of management ethic that then sort of propagates itself forward.” It’s uncertain whether that will ever happen, so funding is important. “Different versions of these incentive programs have been around for a very long time, so it gives you some hope that they will stay around,” he says. Plus, there’s the new analysis, which Reiter hopes will reach people who may be considering similar conservation strategies. “I think our study really shows the value of these incentive programs," he says, "and so we just hope that managers can see these data and see that -- hey -- there is real value in doing these programs, and particularly in drought years, as we saw, and think about how we can make sure that these are sustained into the future." For now, birds visiting the Central Valley have a little more room to roost.